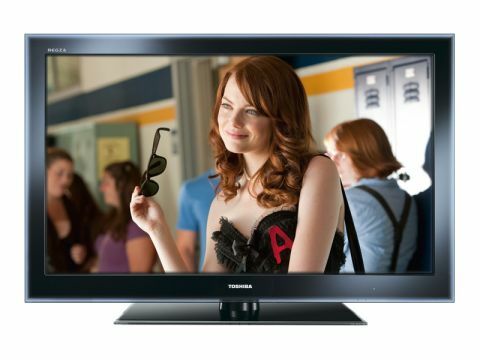 Can Toshiba's networkable Freeview HD LED TV help it catch up with its flatscreen rivals? Toshiba has struggled somewhat since the demise of its HD DVD hi-def disc format. Late on the Blu-ray bandwagon and slow to announce a 3D set, the brand will be hoping its 2010 flatscreens help it reclaim some lost ground. The 40WL753 is the manufacturer's flagship until the 3D WL768 arrives in the coming weeks (and hopefully followed by the long-awaited, super-smart CEVO TV next year). With a price of around £800, it's in competition with models like Samsung's UE40C6510, Panasonic's TX-P42G20B and Sony's 40EX503. The WL range is three-strong, with 46-inch and 55-inch models also available. Other Freeview HD-integrated sets in Toshiba's stable include the step-down SL range (in 32, 40 and 46-inch flavours) and the CCFL-based RV lineup (32, 37 and 40-inch). Once out of the box the 40WL753 cuts a curious figure. It's plain compared to some of its rivals, with square edges that are out of step with the current vogue for curves. And although the tinted glass bezel is easy on the eye, it is more than two inches across, which will seem chunky to anyone who prefers looking at the screen, rather than the frame around it.